Ever since Sonia brought back her first mango everything TJ's run a few weeks ago, we've had a box of Mango Joe-Joe's sitting on our counter. I'm not sure why, but neither of us even tried them until yesterday. Maybe it's because we're a little mango'ed-out. Maybe it's because we have willpower. Well, we know that's not true in my case...Sonia's case, possibly. 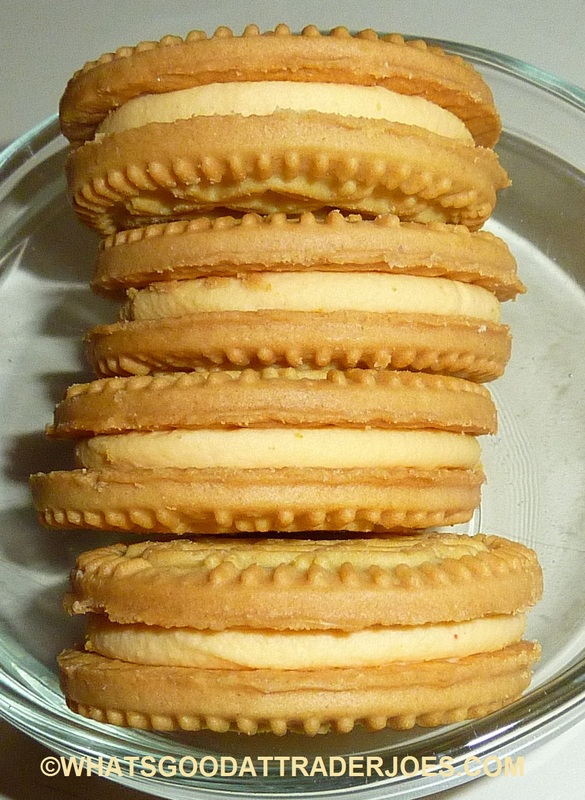 But for whatever reason, I've had this inexplicable, temporary aversion to sandwich cookies. And despite hearing plenty of positive things about them on the interwebs and from readers, these Mango Joe-Joe's haven't even tempted me. Not the least little bit. And now, after trying them, they still aren't calling my name like I thought they might. They're certainly not terrible. I guess fruit-flavored sandwich cookies just aren't my thing in the end. Like any other package of Joe-Joe's, there are two rows of cookies resting in a plastic carton inside the box. Upon opening the cellophane wrapper, there's a distinct fruity smell, although I wouldn't have known it was mango if it hadn't so boldly told me so on the box. There are no fewer than three separate mango ingredients in these cookies, yet I still wouldn't say they taste distinctly like mango. In fact, of all the mango products I've shoveled down my gullet this month, I'd say these taste the least like mango. If I had been blindfolded, you could have told me these cookies were peach or passionfruit flavor and I would have believed you. But that's not a terrible thing. It's a light, tropical, fruity vibe that's not unpleasant—and there's still a significant bready, sugary, sandwich cookie flavor to these snacks. Neither drowns the other out. The box suggests five different methods of consuming the cookies, and I've tried three of them so far. In addition to just eating the cookies like a normal person, I also twisted the cookies apart, licked the creme center and then ate each side individually. I tried nibbling them around the edges until the whole thing was devoured (although I did not squawk loudly when finished, as is officially recommended by Joe-Joe the Toucan). And then I tried them with milk. That was a fascinating experience. 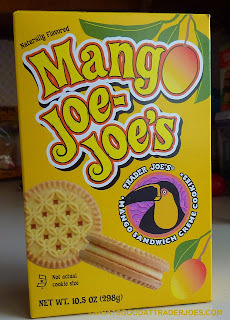 I was actually more impressed with the unique taste of the milk after having Mango Joe-Joe's dunked in it than the cookies themselves. Again, the cookies weren't bad. 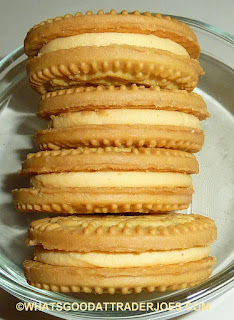 They were just milky, fruity sandwich cookies. But the milk became like some delicious tropical melted milkshake from the gods—not unlike the milk at the end of a bowl of Fruity Pebbles or Froot Loops. I've always loved fruit-flavored milk like strawberry milk and banana milk. Now I can add mango milk to that list, too. Please feel free to disagree in the comments below, but I think I'm only going to be giving this product three stars—a respectable score, but not stellar, either. Sonia thinks they taste enough like mango. She's just not sure they're worth all the fat. She'll give them three and a half. Non-mango reviews are on the way...promise. I love mangoes but don't like all of the mango-added stuff at TJ's with one exception. The Mango Coconut Caramel Corn is to die for! Honestly, I wouldn't have believed it if I hadn't read it online and tried it. It's awesome. The rest... not so good. I agree-Mangoes be gone. The majority of mango "flavored" stuff is not good. Way too sweet. Right up there with strawberry kiwi flavored stuff. 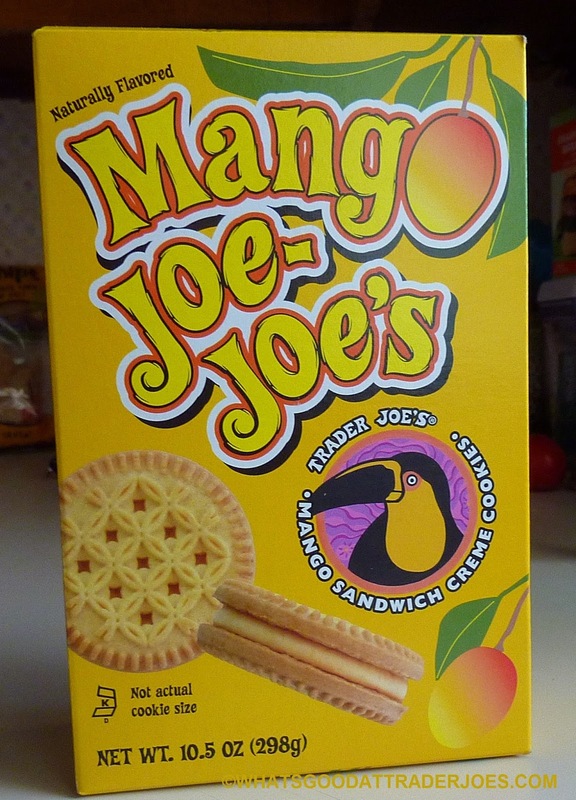 Okay, I love mangoes, and some of this mango-flavored stuff is cool, but the cookies were HORRIBLE! The cookie part was nice, but the filling was way too sweet and tasted like overripe banana. You know how when you put banana in a smoothie, the whole thing tastes like banana? That's how this seemed to me, although I couldn't find anything in the ingredients that indicated there was banana in it...? So after eating a couple, I took them in to work to share. The box sat on the counter next to the coffee machine for a few weeks, and was still half full. I finally took them back to TJ's and the managers who handled my refund were unsurprised. Apparently they haven't been a real winner.